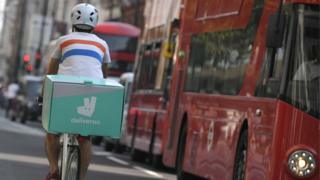 Image caption The European union cited food delivery workers at Deliveroo as one example of the "gig economy"
But casual employees in the "gig economy" - who may work multiple jobs on a flexible basis, or on erratic hours - have fallen into a grey area. Allow employees to have other jobs, banning "exclusivity clauses"
The new rules should apply to all those who work at least three hours a week, averaged over four weeks - at least three million people, though it is a growing category of workers. The rules will also apply to trainees and apprentices in similar circumstances. Enrique Calvet Chambon, the MEP responsible for seeing the law through, said it was the first EU legislation setting minimum workers' rights in 20 years. "All workers who have been in limbo will now be granted minimum rights thanks to this directive... from now on no employer will be able to abuse the flexibility in the labour market," he said. EU officials say the new rules will not apply to "genuinely self-employed" people who work for themselves.